to determine the effectiveness of promotional campaigns and advertising. Whenever we process data for these purposes we will ensure that we always keep your Personal Data rights in high regard and take account of these rights. You have the right to object to this processing if you wish, and if you wish to do so please click here. Please bear in mind that if you object this may affect our ability to carry out tasks above for your benefit. If you wish to read more about our policy and procedures relating to the fair processing of data click here. Our range of rugged in vehicle mounted computers allow you to remain both contactable and connected at all times. Effective and convenient, they help you carry out essential tasks efficiently in a range of environments. With high impact casing, anti-glare displays, high performing processors and glove operable touchscreens, you’ll be able to work in any number of conditions, externally or internally. 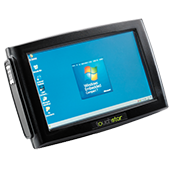 Available products are our own proven TS3000 in-vehicle mobile computer as well as devices from leading brand Honeywell and their Dolphin range. Buying your device from TouchStar offers the added reassurance of quality, reliability and 24/7 support – should you require it. Our UK-based helpdesk and rapid response call-out service means that any problems will be temporary. That’s if you have one – all of our devices arrive onsite preconfigured by a qualified technician, meaning they’re ready to go. If you have any queries, please send us an email or give us a call - our qualified experts are happy to help. Contact us on +44 (0) 161 874 5050. Fully compliant with the ATEX IECEx directive, allowing safe use even in potentially explosive environments, the TS3200-A is built with three key design principles in mind: durability, safety and ease of use. Our Touchstar TS3000 isn’t just an in-vehicle device, the quick-release function means it can be used on the go too. Extremely tough, the TS3000 is fully protected against oil, water and dust, allowing you to use it in harsh environments. For enterprises that require anywhere, anytime real-time connectivity to business-critical applications and data capture capabilities, the Dolphin CT50 is Honeywell’s most productive and advanced enterprise-ready 4G/LTE industrial mobile computer. The TS5000 is designed for all tough and heavy duty tasks. Drop tested, dust-proof and water-proof, the IP67 rated TS5000 provides industry leading ruggedness and reliability. How can the cold chain industry keep pace with consumer trends?